Previously a kingdom and now a Federal Democratic Republic this relatively small Himalayan country has been a richly rewarding experience for travellers over many years. Containing 8 of the 10 highest mountains in the world (including Mt Everest) Nepal is a haven for trekkers. From leafy Annapurna to distinguished Everest this region is peppered with rustic mountain villages, and hundreds of undulating trails that have been trodden upon for centuries. This magnificent scenery it is surpassed only by the friendly mountain villagers that live along the trek path. It is they who often make the most indelible impressions. 40 different races and tribes make up the population of this colourful country. From the high alpine areas Nepal drops to temperate hills where fast flowing rivers are perfect for white water rafting and other adventure sports. To the south, its subtropical border areas are teaming with wildlife and a visit to Chitwan National Park is a must to see tigers and rhino. Lumbini, a small town near the Indian border, where the Buddha was born, is always on the itinerary of any spiritual enthusiast. Kathmandhu and its surrounding valley is a high point in any tour of Nepal. The architecture and art here rival any of the most sophisticated. Marvel at Durbar Square, the traditional heart of the old town. You can spend hours simply exploring, or wander further and you will find, temples, palaces, shrines and legends at every turn. Amidst such wonder is the ceaseless frenzy of all kinds of traffic, yet you can always find that little nook with an excellent piece of chocolate cake or western pastry! Small, wonderful and often quieter towns are nearby – explore the beautiful views and Newari architecure of Nargakot or visit the ancient timeless town of Bhaktapur – it has magnificent local architecture and an active cultural life. Although Nepal’s shrines and gods are mostly Hindu, there is also important Buddhist monuments and communities in Nepal. For something completely different circumambulate all three stupas - Boudha, Swambhunath and Namo Buddha in one day and enjoy the merit for lifetimes! Nepal is an intriguing and welcoming destination for all. The bustle, architecture, temples and art of Kathmandhu are the centre and backdrop of your visit. Visit Durbar Square and surrounds. Shops galore in Thamel, Patan for arts and crafts and nearby townships of Nargakot, Bhaktapur, Parping and Dhulikhel for something quieter and different. The magnificent stupas and Hindu temples for a slice of culture you will not forget. Circumambulation of this great stupa takes place every early morning and evening by the local Tibetan population. Join in the lighting of butter lamps, do prostrations, or simply enjoy a coffee or local meal after searching for local handicrafts around the stupa walk. Many Tibetan monasteries surround the stupa area. Built is the 17th century this is one of the most important Hindu temples to Siva in the world. It attracts devotees and sadhus (holy men) from all over. Another great stupa and this one atop a hill, which legend says, arose out of an ancient lake. Monkeys galore guard the stairs to the top – hence the nickname “monkey temple”. Overnight stay at a lodge with great views of sunrise over the Himalayas views - 32 km from Kathmandu. Leave on a downhill hike. About 1 hour from Katmandhu this area hosts various Buddhist monasteries/hermitages and a self-arising Tara statue. The Valley is filled with courses in spiritual practices in anything from meditation to thangka painting. Nepal is filled with easy, moderate or challenging treks. You may wish to experience the Kumbhu region and its Sherpa peoples – then its Namche Bazaar and views of Everest for you. Or you may wish to head to Pokhara and onto the famous Annapurna circuit trek. Wherever you head in the Nepal Himalayas there are well worn treks of all types. For the adventurous sporty types there is paraglidng, river rafting, and jungle safaris. Many of Nepal’s treks either begin or end at the beautiful lakeside town of Pokhara. Here you can sit by the lake, quietly watching the mountain’s reflection or chat with fellow travellers while sipping coffee and enjoying a sumptuous meal. Visit the Peace Pagoda and the new International Mountain Museum as well as many other sites and adventure activities. This protected nature park covers 932 sq km of forest, marshes and grassland. It is one of the only refuges of the endangered species of one-horned Indian rhino – viewing is by elephant safari! You may also be lucky enough to see a Bengal tiger, leopards and the rare Gangetic dolphin. The nearby village of Sauraha is an excellent alternative to staying in the park. The Mayadevi temple marks the exact birthplace of the Buddha. There is also a sacred Bodhi tree, ancient bathing pond, monastery ruins, and a pillar that marked Ashoka’s visit. Today many new monasteries of all traditions are spinging to life. Lumbini is close to the Indian border. 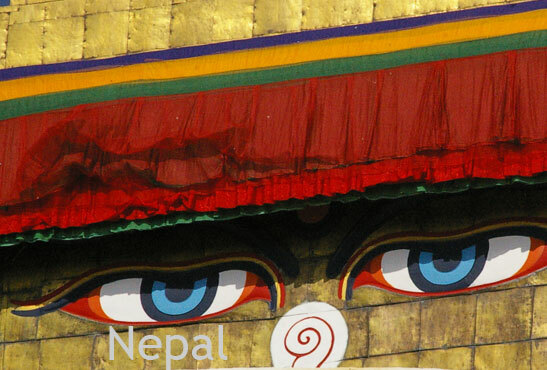 Kathmandu is a popular and convenient place to obtain visas and travel to Tibet by road or by air. September to December is generally best - after the monsoon and before the cold of winter sets in. The hilly areas are best in the months of May and June when temperatures are between 20-25 degrees Celsius, however later the monsoon time makes hilly areas dangerous.